A rather long story about a painting – from tantrum to breakthrough. During the past Summer I took some time to be a student once again – booking on some classes at Leith School of Art in Edinburgh. You can find my blog post about the Painting the Portrait class I did here. I also took another course which I had been planning to write about a wee while ago. This course has such a huge impact on me that the experience is still being felt in my studio work now so it felt like a good time to look back and record this time. This is a rather long post (aren’t they all?) but I really wanted to record this workshop in as much detail as I can as it was such a valuable experience. My work has had such a dramatic development this past year or so – moving more from portraits and figures in landscapes into being primarily landscapes (both representational and more abstract). So it was tempting to book on a couple of landscape courses in order to consolidate my practice in some way or learn more about the various ways of working from my environment. I had a gut feeling, that where I am in my own practice is where I am supposed to be (for the moment). I am moving forward in an organic way that feels somehow satisfying without all of a sudden adding new sparkly techniques or materials into the mix. I think I am happy to go deeper into my current work rather than taking a sideways detour into something ‘new’ at this time. However, I was eager to be a student once again and refresh my practice somehow and so I chose to do a class in painting portraits and one on painting the figure. 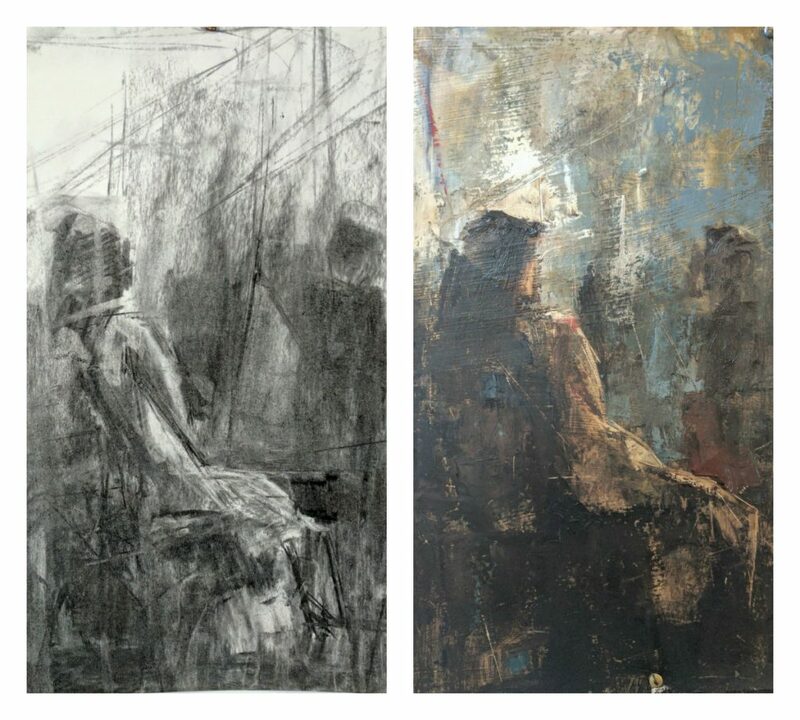 The theme of the figure painting course was to ‘create a deeper engagement with the figure’ – working from one pose for the whole five days. Beginning with the fundamentals of line, value, colour, composition and working towards a more profound connection with the model and the resulting work being created. This excited me as something that I have consciously tried to bring to my portraits is something that goes beyond description but builds on a more expressive response to the face. 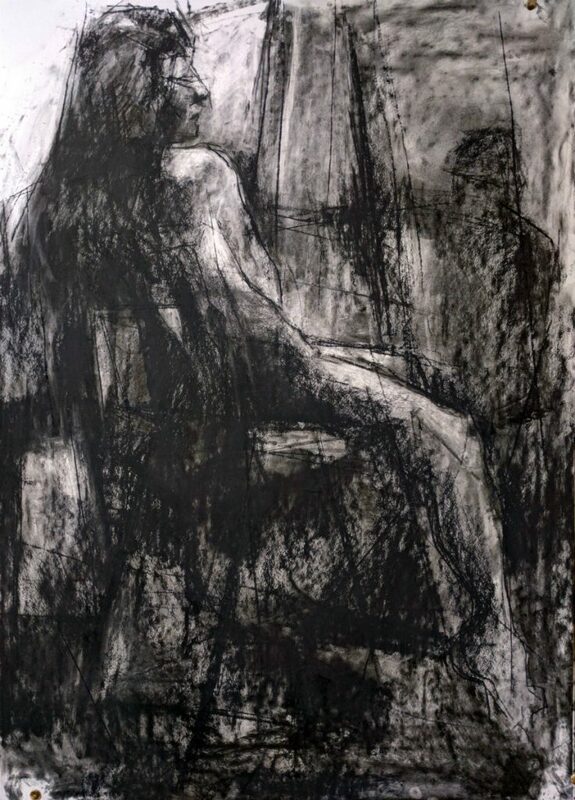 The first day saw us working in simple materials – charcoal on paper – creating many quick drawings in order to understand and record the aspects of the pose we were working from. I am going to be honest here. Right from the beginning I was struggling. Being a relative newbie to Leith School of Art I had not realised quite how early folks arrived in order to pick their ‘prime spot’ in the studio. Arriving just a bit early I found myself last to pick out my easel and space for the duration of the week and was rather dismayed when I first saw the angle I was to be working from. As mentioned – we were working from the same pose (in the same position) for the whole duration of the course and other folks were much more prepared than I was in their choice of position! I took the last spot that seemed ideal in terms of being able to spread out and not feel crowded in setting up my work-space but when the model got into position I found myself looking at a wonderful view of her hair falling down her back, her head turned away, a wonderful slither of her hip and top of her leg and a fabulous view of the chair she was sitting on. 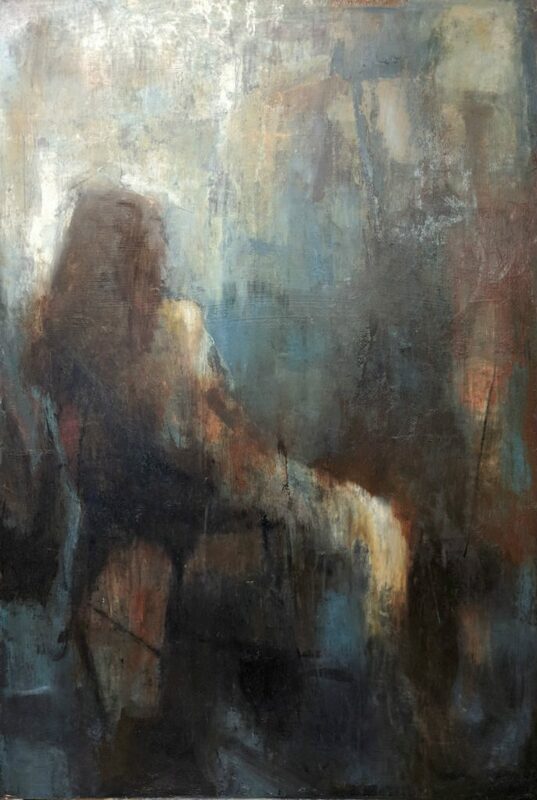 Much of the figure for me was also in shadow against the lighter backdrop of the studio meaning that there was very little variation in value or detail to work from. Excuse the terrible photos – these are three of about ten drawings I did on the first morning. Starting at a couple of minutes in duration and up to around ten minute poses. The other seven pretty much look the same as the second and third one here! One thing I never wish to be is a Moaning Minnie or a bother to anyone. I know full well that for me it is better to change my attitude rather than trying to force a change of circumstances. I have worked very hard on this in recent years and I am also one to not give up easily. When faced with a challenge I would rather pull my socks up and come up with a solution than take an easy way out. So chatting with the tutor I explained how I was feeling and asked him (challenged him!) to give me a good talking to and help me find a way of seeing the figure differently. To work with what I had and get a ruddy grip. He kindly offered to move me to another spot but I am pretty determined and instead we talked about ways that I could explore a different way of working with the figure than the obvious one. My larger drawing from the afternoon on the first day. Beginning to see ways of abstracting the figure into the background. 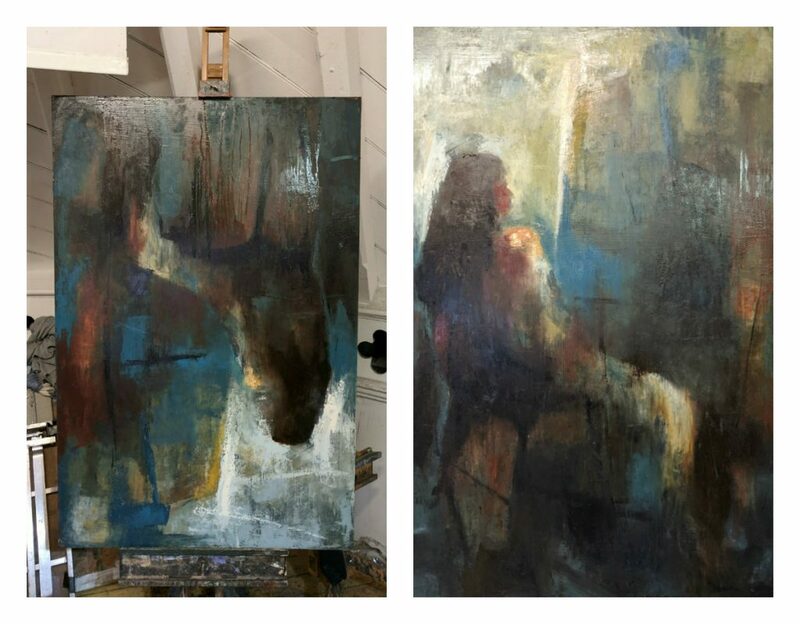 Our conversation worked splendidly and I went into the afternoon session with a complete change of attitude and an eagerness to somehow abstract the figure into the background – making the surrounding environment as much of a feature of my work as the figure itself. This was the resulting drawing and I was over the moon with how it came out – knowing that this was just the first day and excited to see where I could take the inspiration next. I had been so fixated on ‘engaging with the figure’ the whole morning that it seemed a complete revelation to realise that a figure painting could be so much more than just a figure. It seems completely obvious now of course (and really it was something I knew already) – but a person is someone who resides within and engages with their environment and that can very much be a way of us engaging with a portrait or a figure in a painting. A large, quick colour study in oils. 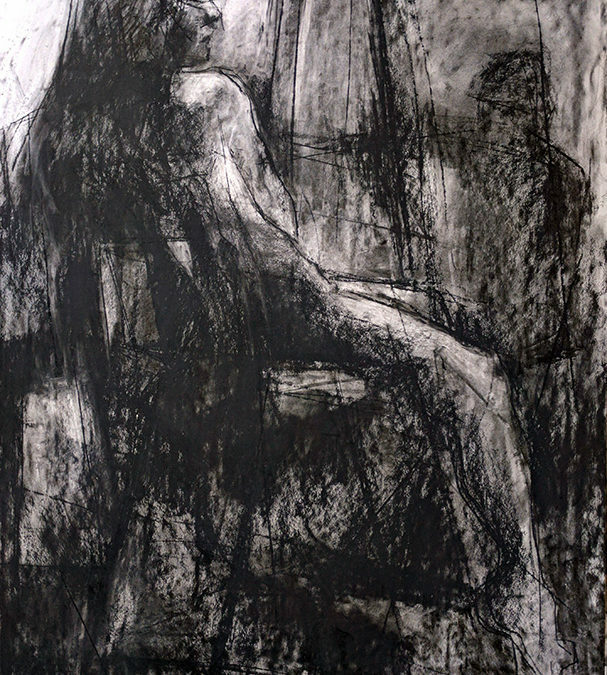 Working as much from my last charcoal drawing as the figure in front of me – exploring values as well as colour. The second day saw us working on many studies to further our understanding of the figure and explore different ways of interpreting the figure in-front of us. I love creating studies – almost as much as I do working on final pieces and for the first one I went pretty big at around 32 x 20 inches on card. With the tutor coming around the room regularly I was able to really chat about my work and the ideas I was having. I came into the week expecting to do something different from my usual work but what was really interesting were the discussions where Matt helped me see that I could take my own approach to painting but push it that wee bit further. 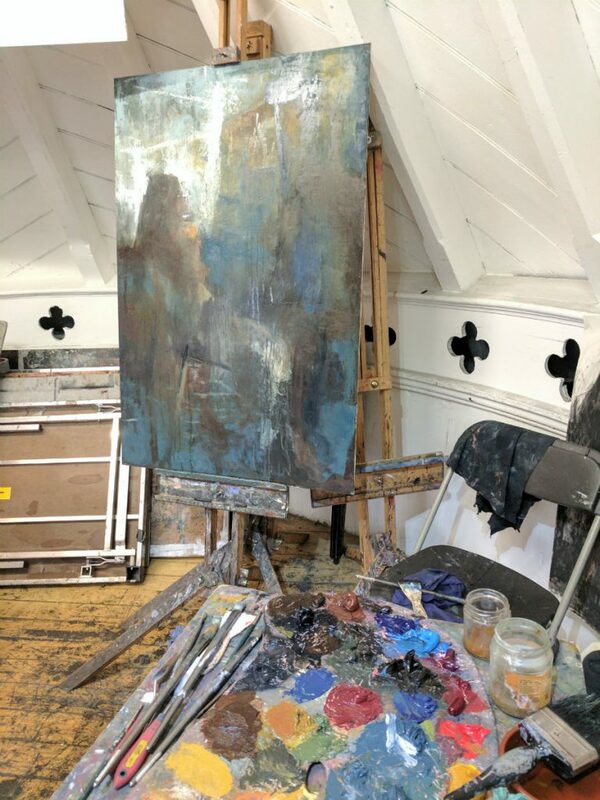 That really helped me turn a corner and focus on exploration and working without expectation – working in a way that felt ‘me’ but going deeper into my own practice. I continued to create studies exploring ways of really working with the background and avoiding putting the figure in the middle of the composition. Pushing the abstraction of the figure to see how far I could go with it. By the time I got to starting the painting that I would be working for the rest of the week I was really excited about seeing how far into abstraction I could take the figure and how much of her I could lose into the background. Working on board this piece is around 47 x 32 inches. One joyful experience in this workshop was hearing the tutor saying to me exactly the same things as I try to instil into artists when I am teaching. Such as – ‘don’t think about it becoming a good painting’ and ‘it is about process not product’ – ‘don’t be afraid of taking risks and it all going wrong’. ‘Be okay with that’ …. ‘experiment’ …. ‘explore’. It made me realise I am on the right track in terms of the experience I wish for my students to have when I am teaching – but it also made me realise how easy it is to forget these things when you are in a workshop environment and putting yourself under pressure to come up with the goods. The first layers – blocking in the shapes and bringing in some colour. So it would be easy to say that the rest of the painting went smoothly – but you know that is not the way it works. I would also be lying if I said at times I was not tempted to go back into childhood tantrum mode when I felt a little helpless about making something of this figure that I had struggled with so much at the beginning of the week. But I worked and worked on this piece, over and over. Losing it and finding it again. I was determined to take risks even if it meant that I had nothing to show for my efforts at the end of week. Not loving the view of the figure meant that I did not feel attached and could paint and destroy over and over. Scraping off many layers and at one point (at the encouragement of the tutor) laying it the floor and pouring turps over with fluid white paint to try to create some random areas of light and interesting textures. Embracing the unpredictability of having no control of whether that paint described the light on the leg or went all over the place and just created a mess. On day four I had a complete revelation due to a suggestion by the tutor. One, I began another painting so that I had something to work on in the moments of frustration with the main one. (More on that in the future as that painting I feel will led to other revelations in time). But the main turning point was when Matt helped me see that we do not have to be a slave to the thing we are working from. If we have a model in front of us, at some point we can choose to go our own way and work with what is on our canvas rather than strictly working from the figure. This was like being given permission to do something so radical and rebellious that it just about blew my mind! Anyone looking at the painting in the future will not have even seen the figure that the painting was inspired by. So my job is not necessarily to render the figure in accurate detail or make a picture of what was in front of me. My job is to respond to the figure in my own way and create my own interpretation of what I saw and at some point that becomes about responding more to what is on the canvas – to work on the painting, not the model. Martin suggested I turn my easel the other way so that I was facing away from the model. To work on the painting with no further need to refer to the figure before me. So I did this … for the remaining two days and it was another turning point – not just for this painting but for my ongoing art practice as a whole. It was like a light was switched on. You can see above that at some point I was working upside down and at another I thought it necessary to ‘paint the face back in’. All the different stages of exploration. But I did lose that face again and I am glad I did! Another revelation was in working with strong shapes. I have such a love of creating atmosphere in my work – layers and layers that overlap, edges that become lost. Strong contrasts in value but areas that disappear into one another. It was suggested that perhaps I could try creating some stronger shapes within these layers. Not in order to lose that atmosphere that I love so much but in order to create a much stronger composition and ways of leading the eye of the viewer around the piece. Places for the eyes to rest. I worked really hard at this over the final two days – and it became an ongoing battle between losing the edges and blurring things away to nothing and bringing back structure and a strong foundation in composition. I loved this exploration of finding a balance that worked for me and I feel the work is stronger for it. Over the course of this painting it went through many, many stages. Points of revelation and points of complete crisis where I wanted to give up. Moments where I liked it (even loved it) and then in that search for the ‘unknown thing’ I ruined it again. There also times when an accidental happening led to a purposeful decision. 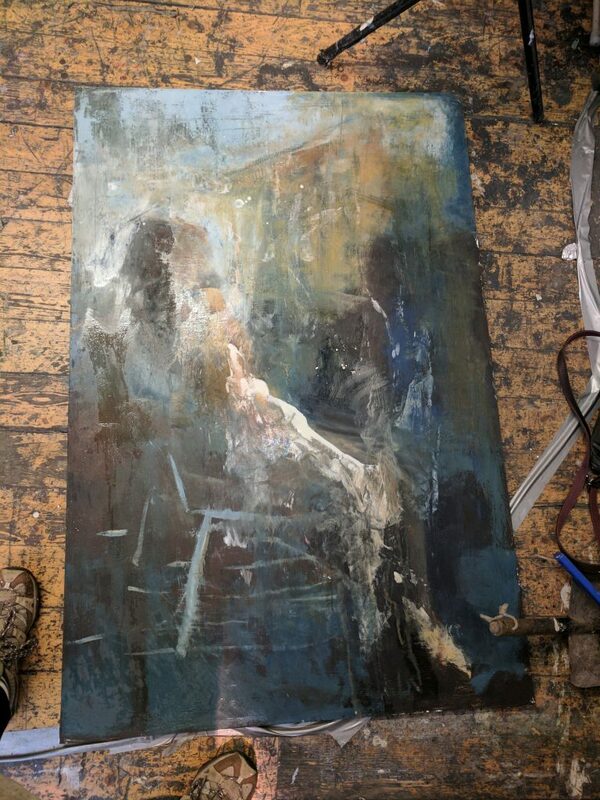 At one point I was looking at the painting and there was a whole area underneath the chair where the light from the studio was reflected in the wet paint and it almost looked like aged bronze. It was beautiful and so I took a photo of that reflection and then built up colours and layers in that area to reflect what I had seen in the wet paint. Another element that took different paths was that at one point I had created the silhouette of one of the other students who was across the other side of the room from me. This was almost unintentional as I worked with abstracting the background. 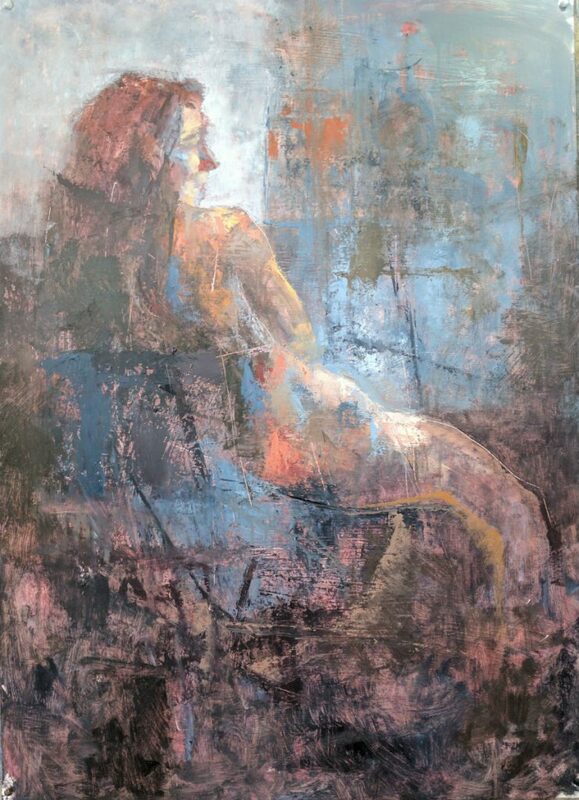 But the result was quite surprising as it added the bare impression of another figure which gave a sense of the focal figure engaging with someone else in the composition. This second figure came and went, at times more obvious and at other times barely hinted at. 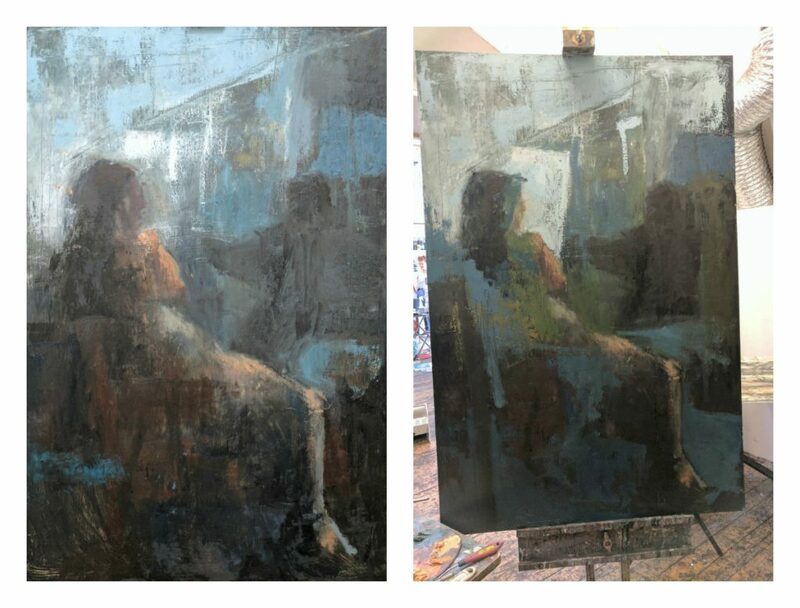 In the end that figure became as much of the background as any of the other shapes but I loved playing with that idea of how much the other figure could change the mood of the painting. A huge part of the process of this painting came to be much more than ‘what to paint’. It became a lovely exploration in editing and destroying over and over again. There were many times when it could have been finished – on the second last day for instance I felt a few times that it was done. But I always had the question in my in my mind of ‘how far can I push this?’ and so I decided to work on it right up until finishing time on the last day and wherever it ended at that time would be a revelation (or something ruined). With just under an hour to go I turned it upside down and lost much of the fresher layers with turps before bringing some of those areas back out again. A decision that really just pulled everything together in the end. Even with this long post I can’t really put into words all I learned in that week. But I do know that this one painting has had and continues to have an impact on my recent and current work in the most surprising ways. The biggest surprise is that this one painting of a figure could have such an influence on the landscape work that I have been creating recently – something that I could never have predicted would happen! It has also led to some sleepless nights as it leads me to think about many ideas for future work – not just for next week or next month but work that could be challenging for me to create in my current studio space. But I am making notes – lots of them – and recording my thoughts in the event that my ideas have a chance to come to life in the future. I do like a challenge – so I am eager to see what comes next. The above piece remains untitled and is currently in my corridor space where it is the first thing I see when I get to the studio as a reminder to myself to constantly work on the things that challenge me and to go into my work-space with an attitude of exploration and experimentation. It isn’t even really about the finished painting – but more about the experience of that whole week. I think I shall keep it there for a while. If you made it to the end of this rather long post – then thank you for taking the time to read! I would love to know what your tactics are for going from tantrums to breakthroughs with your work? Thank you for an inspiring post. I have certainly been in the same position and had similar frustrations. It was good to hear how someone else handled the situation. In my case, the instructor rearranged the room and brought in a second model so the students on the periphery had an opportunity for another view. It was my best painting of the entire class. A fresh view might have had something to do with it. It was also the last day and the last sitting. Hope to study with you one day. Wow Gillian – I made it all the way through – riveting from beginning to end. It is so rare that I get the full story told to me from an artist about her/his piece – how it came about, how it changed and evolved, what the challenges and pushes were and especially those Ah Ha moments. I whole heartily enjoyed this journey with you. It is doubtful I will ever take a class from you, however we may cross paths at Kathie V’s home some day … in some way …. and I will give you the big hug you deserve for sticking with it for the week and then sharing it here with us. Thank you so very very much.